DGE – All Ohio P.E.T.S. Carolyn Huston joined the Lorain Rotary Club in December of 1999. She served as the Club Treasurer for twelve years before becoming President-elect, then President in 2015-16. She is a member of the Paul Harris Society and a Major Donor to the Rotary Foundation. 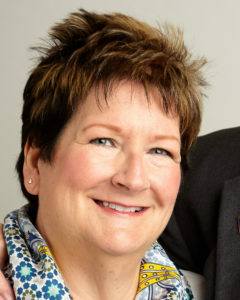 Carolyn is a graduate of RLI (the Rotary Leadership Institute), and is a Faculty Member of the Great Lakes Division facilitating in Districts 6630 and 6650. Carolyn became involved at the district level of Rotary after attending her first district conference in Toledo in 2012. She has served on the District 6600 Foundation Committee in the administration of district grants. In 2014-15 she chaired the Annual Program Fund (EREY) sub-committee and has worked for several years doing Polio Plus presentations to clubs. She is an active member of MESA and has attended 5 Uniendo Project Fairs. Recently Carolyn participated in a pilot program for MESA in Morazan State in Honduras. The program sought to organize local clubs to determine the needs of medical clinics in their areas and communicate these needs to MESA. Carolyn is involved in her community. She is an alumnus of the Leadership Lorain County program. She served for six years on the Advisory Board of the Women’s Fund at the Community Foundation of Lorain County – first as Treasurer and then as Co-chair. She served for three years on the board of Genesis House/Lorain County Safe Harbor – Lorain County’s domestic violence shelter. Nine years ago she founded the Genesis House Pajama Party which is held every January to raise awareness of the Genesis House and is also a major source of in-kind donations for the shelter. Carolyn is employed as the CFO of Superior Electric Supply Co. in Elyria since 1984. 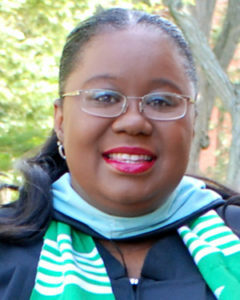 She holds a Bachelor’s Degree with a dual major in Accounting and Business Management. Carolyn and her husband Bob of 47 years reside in Amherst. They are the proud parents of four children and have five grandchildren. Carolyn is an advocate for more Rotarian leadership and involvement. John Reyes is an Ohio native having been born in Steubenville. He grew up in Stark County, graduating from Sandy Valley High School and completing his undergraduate work in political science at The University of Akron. Thereafter, he attended and graduated from The Vanderbilt University School of Law in 1978. 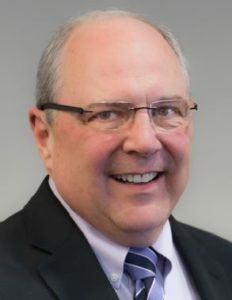 He has practiced law in the fields of commercial litigation, products liability defense and public law with the law firm of Buckingham, Doolittle & Burroughs in Akron, Ohio from September 1978 to date. John is married to Linda, a Cleveland native, who is an infection control officer for Fairview Hospital, a part of the Cleveland Clinic Group. They reside in West Akron and have four children and two grandsons. 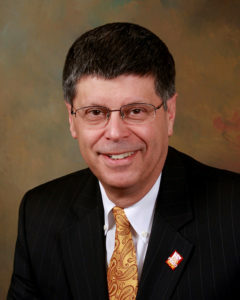 John began his Rotary career in April of 1994 with the Rotary Club of Akron and has served in various capacities including Club President, a member of the Club’s Board of Directors, and a member of the Akron Rotary Foundation Board of Directors. In addition, he has had the pleasure of serving as an Assistant Governor, a member of the District Finance Committee, a member of the District Grants Committee, the District Bylaws Committee, the District Nominating Committee and was Chair of the District GSE Team in 2012. John is both honored and humbled to be asked to serve as the District Governor for the 2019-2020 Rotary year. He is extremely excited to work with the superb All-Ohio P.E.T.S. leadership team. Dan Morgan has served as a State Farm Agent in Canton for 32 years. In October of 1986 Dan opened his Agency with no clients. That agency has grown to be a large multi-line agency offering over 120 products. His mission, from the beginning, has been to help people manage risk, achieve their dreams and plan for their future. Dan’s wife Vicky, joined the agency in January of 1990. Together they have focused on serving the needs of their family, team, friends and clients. In January of 1990, Dan Joined the Rotary Club of Jackson Township. He was delighted how closely aligned the core values of his professional career with State Farm Insurance were to the core values of Rotary International. He immediately implemented Rotary’s 4 way test and code of ethics in his business. Dan has served his club as Vice President, President Elect, and President in 1994-1995. He served as Chairman of the Board, Treasurer, Director of Club Service, Foundation Chair, and on numerous other committees. 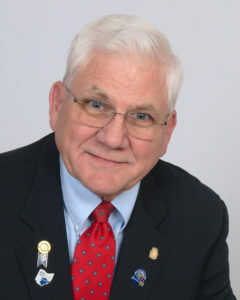 Dan served the district 6 years as Assistant District Governor. He has served on chaired or co-chaired many different District Committees in the past three years. So far his favorite Rotary theme has been, Reach Within to Embrace Humanity. Dan was born in Canton, Ohio and attended Perry High School. He is a graduate of Muskingum College majoring in Business, Economics and Psychology. Dan then served the Timken Company for almost 10 years as an Industrial Engineer and also in Management. Dan is a member of the Canton Chamber of Commerce, Jackson Friends Church and, a Masonic Organization, Clinton Lodge #47 in Massillon. Dan and his wife Vicky have been married since 07/31/1976. They have one daughter named Dr Stephanie Morgan/ Harding. Dr Stephanie is an Orthodontist in N Canton, Ohio. She is married to Aaron Harding. Dan is passionate about our membership and Rotary Foundation. He is looking forward to serving the members of Rotary for many more years. Gary Vaughan is married to Janet and they have been married for 47 years. They are blessed with two children and four grandchildren. Gary has been responsible for the operation water/waste water utilities for 25 years and has been an Environmental Consultant for 20 years. Gary has been a Rotarian for approximately 30 years, he is Paul Harris Fellow, as well as a member of the Paul Harris Society. He has been very active in District 6690 and has served 12 District Governors. He is currently serving as the District’s 6690 Chair of the International Service Committee and the Giving Chair. Gary led a team to Kenya to work with the Rafiki Aids Orphanage and worked on a design and budget that resulting in a bore-hole (water well) for the Orphanage. Gary, while serving 4 years with the Salvation Army medical brigade to Honduras recognized that most of the illnesess were water borne and the doctors were treating the symptom, not the root cause, polutted water. He has subseqnently led two Rotary teams to Honduras addressing water/sanitation issues. Gary has traveled across the District promoting Matching Grants and raising awareness of the need for clean water and basic sanitation. He has encouraged clubs to partner together with other Districts on matching grant projects. Gary has served as presenter at the annual Foundation seminar, the District Assembly and other District functions. He was one of the founding members of the Water and Sanitation Rotarian Action Group (WASRAG). He was awarded the “Citation For Meritorious Service” from The Rotary Foundation of Rotary International, in April 2010.